TEUFELBERGER develops and produces highly compacted high performance steel wire ropes that can be used as hoist ropes and auxiliary hoist ropes on ship cranes. Operations involving the lifting of heavy loads aboard ships must be carried out safely, reliably, and cost-effectively. To do so, using suitable high performance steel wire ropes is indispensable. Hoist and auxiliary hoist ropes from TEUFELBERGER offer outstanding longevity when tailored perfectly to the respective crane and its requirements. This helps reduce overall costs incurred by ship crane operators. For the challenging tasks on ship cranes, TEUFELBERGER delivers highly compacted hoist and auxiliary hoist ropes that have stood their own on cranes from leading manufacturers such as Liebherr, Huisman, NMF, Cargotec, and Palfinger. PLASTFILL®, i.e., a steel core impregnated with special plastic material, ensures high safety and corrosion protection of the core throughout the rope's entire life span. 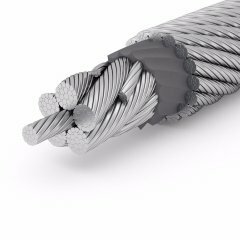 The innovative EVOLUTION construction of TEUFELBERGER's rotation resistant high performance steel wire ropes allows using these ropes with larger fleet angles. Furthermore, this construction - in combination with our proven manufacturing technologies - allows trouble-free operations even with a large number of reeving arrangements, as these steel wire ropes are particularly flexible. 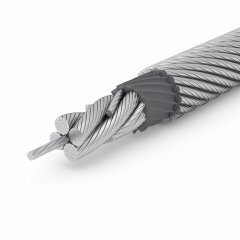 Due to the SUPERFILL® technology, a proven compaction method developed by TEUFELBERGER, our closing ropes feature extraordinary lifetimes as wear is minimized because of the round rope surface. Well-thought-out high performance steel wire ropes require suitable end terminations which, at TEUFELBERGER, are standard parts of the product. Besides, no rope will leave our manufacturing plants without having undergone thorough and comprehensive tests and inspections. Also, we deliver our ropes on time and together with the necessary certificates. EVOLUTION TK18 combines all characteristics required of a rotation resistant high performance hoist rope for heavy lift applications. Takes breaking forces to another level for special customer needs in rope grade 1960!